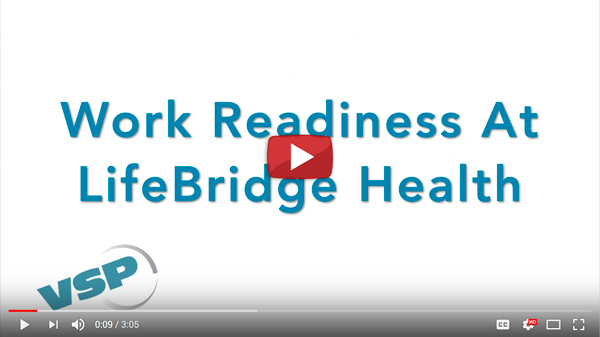 The Work Readiness at LifeBridge Health program consists of skills development in three major areas: development of appropriate work behaviors, abilities and retention skills. These skill areas are often a challenge for individuals who have been out of the labor market for an extended time period or have barriers to employment success. Our staff provides guidance and support as trainees learn appropriate work behaviors in a healthcare setting. The skills developed by the trainees help them begin an active job and enter the workforce fully prepared. To learn more about the Work Readiness at LifeBridge Health program, click here to download the brochure or click on the image below. Job placement services can be provided for a fee to Work Readiness at LifeBridge Health program graduates.